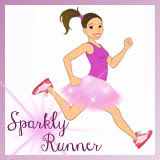 Sparkly Runner: Happy 4th Birthday, Sparkly Runner! Happy 4th Birthday, Sparkly Runner! In honor of Sparkly Runner's fourth birthday, here are two "fab four" lists, a trip down memory lane, and a sweet giveaway for one lucky reader! 4. New Run/Walk/Run Strategy from Jeff Galloway I'm kind of surprised this one made the top four- I guess folks like the Galloway method! 3. 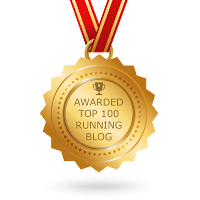 2014 Wine & Dine Half Marathon Review Ok, this post is the third-most read on my blog and I didn't even write it! 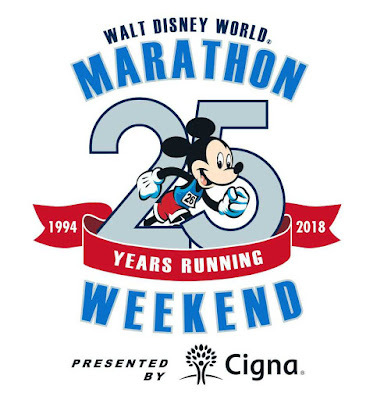 😎 One of the bloggers that I stalked followed leading up to the 2013 Disneyland Half Marathon, Matt from Hokeyblog, and I partnered up to switch race recaps as he ran the half and I walked the 5k- my first one back after the stress fracture. You can read my recap on his blog here. 2. 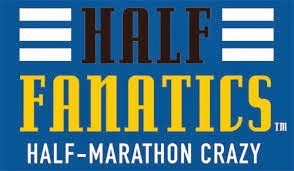 2014 Race Recap & Review: Harrisburg Half Marathon This was an awesome race (even though I ran it on a broken foot) and I cannot wait to run it again in September. 1. Accountability Monday: 9/29/14 Again, somewhat surprised that this one is the most-viewed post on my blog but google analytics doesn't lie. This was right after the first race I missed because of my stress fracture. 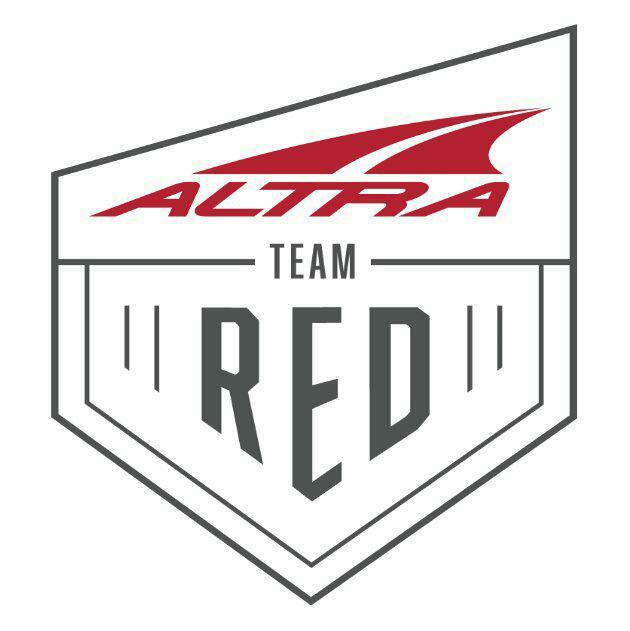 What I thought would be a soul-crushing weekend ended up being really amazing and supportive- my running ohana are the absolute best. 4. Character Photo Ops at the Walt Disney World Marathon Weekend This was the first time I participated in a virtual blog hop and I got to meet some really cool bloggers/runners as we were linking our posts together. And writing about runDisney character spots is one of my absolute favorite things to write about! 3. Race Recap & Review: Run Swim Run OBX My first not-just-running event was super scary but also super empowering. I loved doing it and loved writing about doing it too! 2. Promises I go back to this post often to remind myself that I am capable of discipline, hard work, and success. 1. Spectating the Inaugural Pop Art Half Marathon There are no other words to describe this experience other than pure magic. This post still brings tears to my eyes rereading it and remember what a special day it was. Ok friends, because you've stuck with me for four years, I've got a giveaway for one lucky reader! Pretty cool, right? Follow the directions below to enter to win! My absolute favorite medal holders come from York Sign Shop so I want to give one away to one of my readers (as in, I buy it and ship it to you). 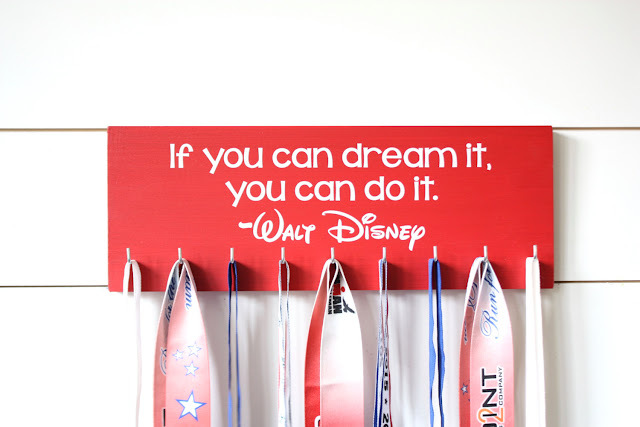 And what better holder than one with a quote from Walt himself?! Some rules for this giveaway- it will run until 7/29/17 at midnight. At that time, rafflecopter randomly selects a winner from all the entries. The more points you accumulate, the more entries you can get- make sure to tweet about the giveaway every day to get more chances to win! I will contact the winner on 7/29/17 by email and will give a two day window to respond/claim the prize. If I have not heard from the winner by midnight on 7/31/17, I will draw another name/winner from the rafflecopter list. And thank you, thank you, thank you for sticking with me the last few years- y'all rock! I think all of Let It Go is my favorite Disney quote! I like "I only hope that we don't lose sight of one thing - that it was all started with a mouse" because not only is it historic, but to me it means that sometimes something small can turn into something huge. Happy Blogiversary Sarah! Love it! And thank you! I have a York Sign Shop medal holder as well... it says "Train Race Beer"! Happy Blogiversary! The Walt Disney quote on the medal hangar above is my absolute favorite Disney quote. It truly embodies my running life, especially how I used to think that there was no way that I could ever be a runner. Boy has my mindset changed! RIGHT?!?! So happy we have met and that running and Disney introduced us!